Like many other Microsoft applications, Lync Server has a high level of dependency on Active Directory (AD). Lync Server must be installed in an Active Directory environment, and there are certain attributes that must be available in the AD schema for Lync to install. For these reasons, Microsoft includes a set of wizards with the Lync media that assist administrators with preparing Active Directory to support Lync Server. Using these AD preparation wizards in the appropriate order makes this aspect of the Lync installation quite simple. However, since the health of the Lync environment is highly dependent on the health of Active Directory, it makes sense for administrators to perform a basic health check of AD prior to using the Lync AD preparation wizards. • All domain controllers in the forest must run Windows Server 2003 or higher. • The domain functional level for domains where Lync Server is deployed must be Windows Server 2003 native or higher (not Windows Server 2003 mixed). • The forest functional level for the forest must be Windows Server 2003 native or higher (not Windows Server 2003 mixed). 2. When the wizard displays, either browse to your intended installation location or accept the default location, and then click Install. 3. When prompted, read the software license terms; then click the I Accept the Terms in the License Agreement option if you agree to the terms, and click OK.
4. 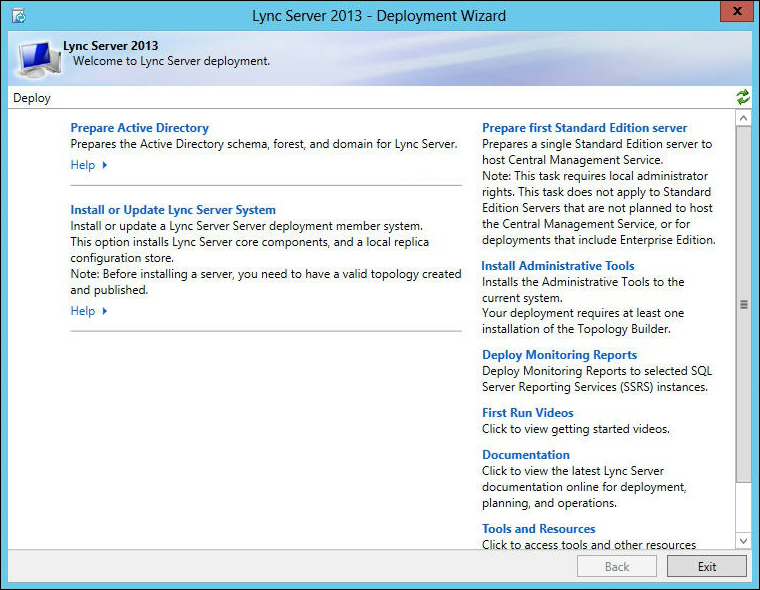 The core components of Lync Server 2013 are now installed, which includes the Lync Management Shell and the Lync Deployment Wizard. When the Deployment Wizard launches, it determines the current state of the environment and provides links to various installation options as needed. In the case of a fresh installation, the option to prepare Active Directory is presented. Click Prepare Active Directory, as shown in Figure 1. Figure 1. Running the Deployment Wizard. To avoid permissions issues, be sure that the domain controller hosting the Schema Master role is online, and that the installer account has Schema Admin credentials, before using the Deployment Wizard. 5. 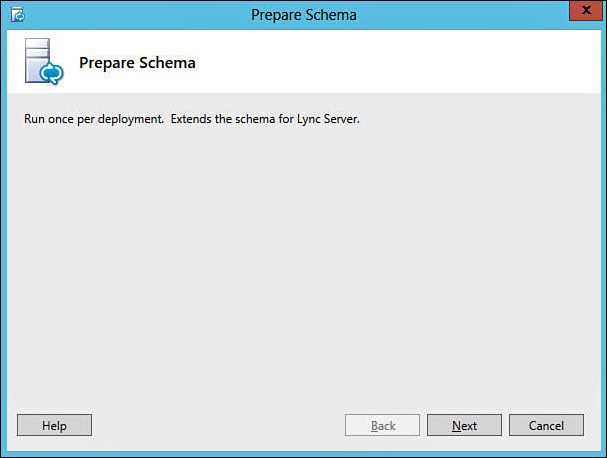 If all the prerequisites are met, click Run on Step 1: Prepare Schema, which launches the wizard shown in Figure 2. Figure 2. Preparing the schema. 6. Click Next. This action invokes the Install-CSAdServerSchema PowerShell command, which loads the AD schema files required for Lync Server 2013. 7. When the command has finished executing, click View Log to review the log file and ensure that no errors or warnings were generated during the schema extension process. 8. When finished, click Finish to complete the procedure and return to the Deployment Wizard. Particularly in larger network environments, after the AD schema is extended, some time will be needed to allow the schema changes to replicate throughout the forest before moving on to the forest prep stage. To verify that replication has completed, the ADSI Edit utility can be used to verify the values associated with the ms-RTC-SIP-SchemaVersion object. If the value of the rangeUpper attribute is 1150 and the value of the rangeLower attribute is 3, then the schema was successfully updated and replication has completed.